Whistler, BC – Twenty-seven athletes between the ages of 13 and 22 tested their capacity for sport performance at its highest level as part of the Canadian Sport Institute Pacific’s PODIUM SEARCH on Saturday, September 20 at the Whistler Athletes Centre. This is the third year for the PODIUM SEARCH initiative and the second time that this event has been hosted in Whistler. PODIUM SEARCH is a free half-day athlete identification camp designed to provide athletes with an introduction to the high performance sport environment. 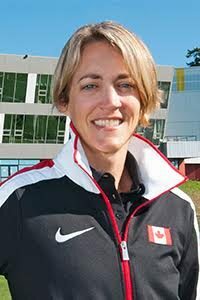 In addition to the testing events, athletes heard from Jordan Sturdy, MLA West Vancouver – Sea to Sky and keynote speaker Julia Murray, 2011 World Silver medallist and 2010 Olympian in Ski Cross. Athletes in attendance got a glimpse of what it takes to be a high performance athlete as they completed their testing alongside current national team members who were also at the Whistler Athlete Centre completing regular training. PODIUM SEARCH is a multi-sport event and athletes in attendance brought a wide range of sport-specific experience including rugby, freestyle skiing, alpine skiing, cross country skiing, cycling, biathlon, para-skiing, snowboard cross, mountain biking, gymnastics, rowing and soccer. The event attracted participants from various regions of the province including Kelowna, North Vancouver, West Vancouver, Pemberton, Whistler, New Westminster, Hope, Ladysmith and there was one attendee from Winnipeg, Manitoba. “One of the special things about PODIUM SEARCH is that it brings athletes together who may live in the same region, share common goals and dreams but have never met because they come from different sport backgrounds. It brings them together and introduces them to the community of high performance sport that they are a part of” says Kurt Innes, Canadian Sport Institute Pacific’s Director of Talent Development. The other unique thing about this type of camp is that it provides the opportunity for young adults who have an interest in high performance sport the chance to experience it first-hand. Innes continues with “on Saturday we had athletes in attendance who are already well integrated in the athlete pathway, we had some who are new to the whole concept of high performance sport and we had some who are completely outside of the system but may have a place within the high performance community”. “Supporting B.C.’s athletes is important in order to develop world-class sporting results. Events such as PODIUM SEARCH give aspiring athletes an incredible opportunity for personal growth and the potential to be identified as future representatives of B.C. and Canada on the international stage,” said Jordan Sturdy, MLA West Vancouver – Sea to Sky, on behalf of Coralee Oakes, Minister of Community, Sport and Cultural Development. Athletes who participated in PODIUM SEARCH on Saturday will be evaluated for possible selection for Canadian Sport Institute Pacific’s Sport Programs based on their test scores during the camp. The next PODIUM SEARCH event will take place in Spring 2015.